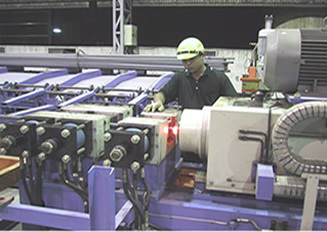 The friction welding is different from normal acetylene gas welding and electric welding, the different point is the friction welding is no need to use other source energy, the friction welding is using the method that weld the work peace itself to create the heat and process the friction welding, therefore it will not effect by the long time process and cause the material become harder or lost the raw material itself original mechanical property, and also the process time is short (only about 5-15 seconds), therefore it is no need to take the tempering heat treatment when after the friction welding of the work peace. Friction welding coupler are already using in USA, Japan, Taiwan, Korea, Singapore, and Finland. In Taiwan 90% rebar coupler market are using friction welding coupler, the reason is because Taiwan government set very high strict law and standard in rebar coupler, and also Ministry of economic affairs industrial research bureau authorize national Metal industrial research center to counseling, promotion the friction welding technology and method, therefore the friction welding rebar coupler are already using in Taiwan over 10 years, compare with other place Taiwan has very mature experience in friction welding rebar coupler. 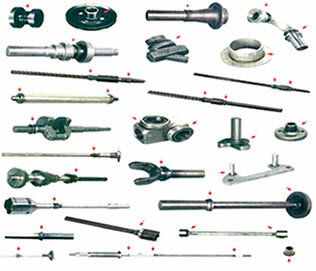 Couplers are produce by steel round bar,and the thread process are by CNC or rolling,both CNC and rolling are with high precision,no need to do the thread process on the rebar,after all to process the roundness thread on the rebar without the real roundness are difficult. After friction welding coupler and rebar,the strength are higher than rebar, complete the pulling force examination, the rebar break. The friction welding point are still keep the original material toughness, the friction welding will not effect the original material strength. After friction welding the internal element structure are complete union, metallographic are complete. Quality control, to test and check the quality match the construction vibration- proof standard, and request. Installation are easy, simple and fast,the quality will not effect by human factor. Friction welding coupler are all process in the factory by automatic process,quality are stable and will not effect by weather, and not delay the construction time. By using high speed revolving welding to create heat energy and under vacuum hot melt condition to forge and increase the surface of the friction welding area of coupler and rebar.